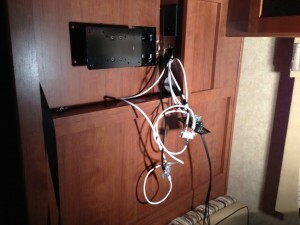 I don’t know who designs the TV connections in travel trailers but I have had to modify all three that we have owned. The Kodiak has both cable and satellite inputs on the outside. The roof antenna and cable inputs came into the TV cabinet over the dinette and went out to an outdoor TV output connector and to the Jensen stereo as a radio antenna but they didn’t go into the bedroom. On the other hand, the satellite input only came into the bedroom with no connection near the main TV. To get started, I removed the faceplates and pulled all the coax out where I could trace it. As I identified each cable, I labeled it for future reference. I added a splitter to the antenna/cable set 2 output and attached a cable from there to where the satellite input had been in the bedroom. I moved the satellite cable to a new coax connector that I put under a narrow shelf below the bedroom TV. I cut slots for brush plates so I could run HDMI cables from the satellite receiver and Blu-ray player to both TVs. I also ran the power cables through them for a clean look with no dangling wires. Now we can access any video source on both TVs without running cables around the wall.